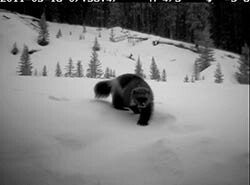 Since Robin Steenweg completed his PhD working with the Canadian National and Provincial Parks to improve multi-species occupancy modeling, the Heb Lab is continuing to work with Parks Canada and British Columbia government biologists to expand our large-scale remote camera trapping grid into southeastern British Columbia. Ongoing work includes developing spatial mark-resight models for grizzly bears, and understanding connectivity at large landscape scales. 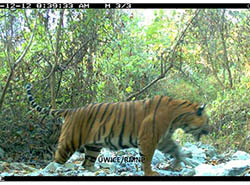 Building on a strong relationship between the University of Montana and Bhutan, PhD student Tshering Tempa are working together with the Ugyen Wangchuck Institute for Conservation and Environment (UWICE) in the Ministry of Agriculture to study the ecology of Bengal Tigers in Bhutan. 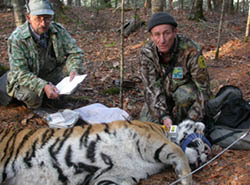 Working with Wildlife Conservation Society-Russia, Mark Hebblewhite and graduate student Clay Miller (Fall 2009), worked with Dale Miquelle, WCS, are investigating a variety of aspects of the ecology and conservation of the Amur Tiger from 2008-2013. Starting in 2015, Mark Hebblewhite and Dr. Wenhong Xiao are continuing these efforts working in the Chinese part of Amur tiger range. 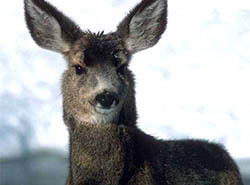 The aim of this research project is to better understand the link between habitat quality and mule deer population dynamics in Idaho, with a goal of building better predictive population models for mule deer management. 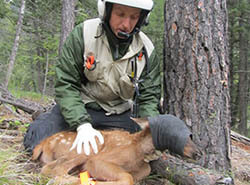 Led by Idaho Fish and Game Mule deer research biologist Mark Hurley. Together with Dr. Kelly Proffitt from Montana Fish, Wildlife and Parks, we investigaged the roles of top-down (predation) and bottom-up (habitat) forces in driving elk population dynamics in the East and West forks of the Bitterroot Valley in Western Montana from 2011-2014. Daniel Eacker succesfully defended his MS thesis in Fall 2015. This project aimed at understanding the consequences of migratory behavior to the ecology and recovery of the Sierra Nevada Bighorn sheep, which is among the world’s most endangered mountain ungulates. 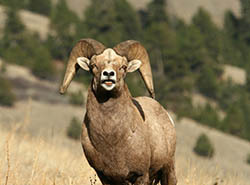 This collaborative research project focuses on explaining plasticity of migration, such as partial migration, in ungulates. The project addresses several questions at different scales from the individual animal to the population and species level. Wibke Peters is leading this research for her PhD, focusing on Roe deer and Red deer in the Italian Alps and through Europe.